Marvel fans, just a heads up — this is going to be a difficult week for avoiding Avengers: Age of Ultron spoilers. The film hits U.S. theaters this Thursday night, but it already debuted overseas, which means people are chatting about it. That said, we’ll offer massive spoiler warnings when we start heading towards dangerous waters, because this tidbit surrounding an alternate ending for the film is going to be something you’ll want to hear. As ScreenCrush found, Amazon.co.uk is already releasing details about the upcoming Avengers: Age of Ultron Blu-ray and DVD release. Along with the announcement that international audiences can start pre-ordering them online, a small message popped up to reveal that the home releases will feature both an "extended version" of the film and an "alternate ending." These are both pretty big deals for different reasons. 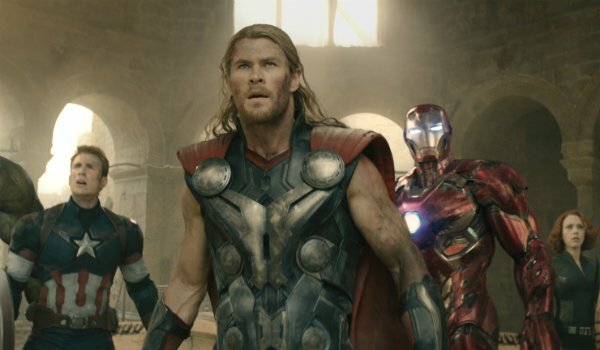 Director Joss Whedon previously said that his original take on Age of Ultron ran for approximately three hours, which means he had to cut more than 30 minutes to make the official theatrical runtime. What could he possibly have cut? Well, for one, remember that mysterious lady we saw in the trailers walking into a pool of water? Many speculated that she could be an Asgardian or even a Wakandan, but in fact she does not appear in the film. Some critics even said that one of the weaker parts of Age of Ultron were these specific scenes with Thor. They were a bit confusing and seemed incomplete. Another small moment from the trailers that doesn’t appear in the film is that moment when Scarlet Witch falls to her knees on a crumbling city street. This moment happens in a different location in a different scenario, so perhaps we’ll also see more of that. First, we’ll start with something we already know. Marvel Studios President Kevin Feige recently confirmed that Captain Marvel was originally going to be introduced in Age of Ultron. However, the team didn’t want her to appear fully formed in such a small capacity. One of the hottest rumors circling the web suggested she would appear in some capacity at the very end of the film. So, now, let’s discuss that ending. Iron Man, Hulk, Hawkeye and Thor all go their separate ways for various reasons, while Captain America and Black Widow are preparing to train their replacements in the new Avengers base in Upstate New York. The new Avengers line-up includes the two veterans, War Machine (Don Cheadle), Falcon (Anthony Mackie), Scarlet Witch (Elizabeth Olsen) and Vision (Paul Bettany). If the rumors are to be believed, Marvel went through alternate line-ups for this ending. Could this mean we might get a different line-up with the alternate ending? There’s already so much going on in Age of Ultron, from Ultron himself to "The Twins" to Black Panther and Infinity War teases, it’s a miracle the film is as fun as it is. You’re going to want to see more after its late April 30 debut, so start saving your money for the DVD and Blu-ray.